A medieval parish church, which may date back to the Late Saxon period. The church dates mainly to the 14th century, and was restored in the 19th century. The 15th century Seven Sacrament font is one of the best examples of this kind of font in the country, and retains much of its original medieval paint. Evidence of early work in amount of conglomerate. Present church chancel of about 1300, tower about 1380, nave and aisles about 1390, transept clerestory, roofs and porch about 1490. Much 19th century restoration. Demolished vestry. A number of good quality and important tombs and memorials. Important 15th century painted font and 19th century lectern. E. Rose (NLA) 23 November 1992. 23 July 2007. Site visit. A trench (450mm deep) for a new electricity cable, running from the north wall of the tower to a new pole by the north wall of the churchyard, was inspected. No archaeological finds or features were recorded. D. Gurney (NLA), 23 July 2007. --- Aerial Photograph: TG 1020A,B. --- Newspaper Article: Eastern Daily Press. 2008. Worshippers plan warm welcome for switch-on. 5 December. --- Leaflet: 1976. 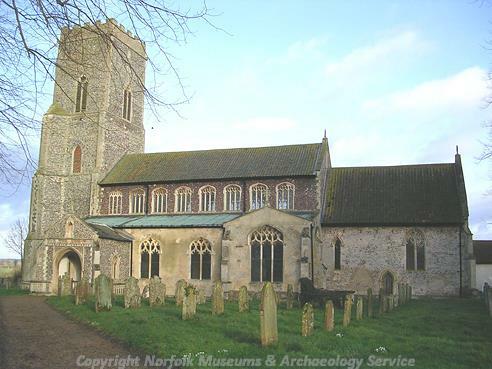 A guide to St Mary;s Parish Church, Great witchingham, Norfolk.. The Cathay Press. <S1> Unpublished document: Rose, E. (NLA). 1992. Building Report..